BHS Compartment Roller Trays (CRT) help to convert forklift battery compartments from overhead extraction to side extraction for faster, safer battery changes. Converting forklift fleets to lateral battery extraction can improve efficiency, reduce the risk of accidents, and lower operational costs, especially in larger fleets. Learn more about the differences between overhead and side extraction here. Choose Compartment Roller Trays in any of three sizes, with a standard 2.19-inch height, 30-inch length, and widths of 7, 12, or 16 inches. Standard CRTs come equipped with five roller tubes and a minimum 1,200-pound capacity. Alternatively, you can have a roller tray customized to meet your own specifications. 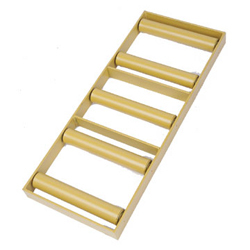 Roller Trays from BHS are built for ease-of-use and efficiency. Heavy duty construction ensures reliability and the OSHA Safety Yellow powder coating resists acid, scratches, and impact. Learn about the benefits of side extraction, CRTs, and the entire line of Compartment Roller Trays by calling the BHS sales team at 1.800.BHS.9500.